Home » Cardinals » Shelby Miller: Is It Time to Worry? Shelby Miller: Is It Time to Worry? Usually at this point in the season, any analysis of players is completely unfair to both the players and the reader and is an over read of a small sample size. But with Shelby Miller, there may be reason for concern. And it may have much less to do with his results so far this year (which are not pretty) and more of a concern that it may be a continuation of what was wrong late last year. In last year’s postseason, Miller made zero starts and only one appearance, pitching 1 inning. Speculation of why was running high with Cardinals’ fans, especially on the internet. What seemed to be the obvious reason for his absence, he was injured, was logically countered by the fact the Cards left him on the roster. Derrick Goold, to an extent, cleared it up in the offseason by claiming he had shoulder soreness. But the extent or severity, along with the secrecy from the club, was never really addressed. Miller insisted that his elbow and his shoulder were fine, and that he hasn’t been limited in his workouts or preparation during the postseason. Miller was not told of any innings limit that he reached. The reason why there should be some worry isn’t from the numbers, but the symptoms he shows of having a sore shoulder. As you can see, his velocity has decreased along with the injury. His peak velocity was in the middle of last year, when he was pitching his best, and his lowest has been so far this year. As this Fangraphs article pointed out, his confidence is very low at this point. Last year he was essentially firing fastballs in as strikes. Daring pitchers to hit him. Trying to miss bats. 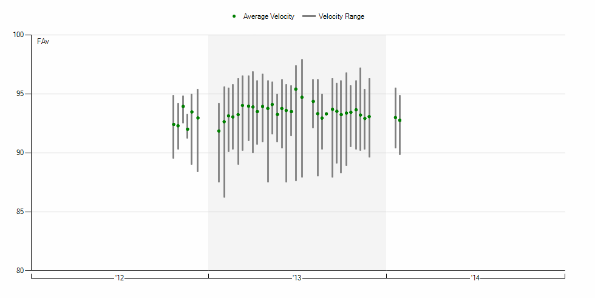 But when you look at the graph, he is getting much less swings and misses on his fastballs and breaking balls, and virtually nil swings and misses on his offspeed pitches. Shoulder injuries are possibly the main deciding injury on a pitchers success. And as has been reported by many medical experts and doctors, it’s not how many pitches you throw, but rather HOW you throw. Miller’s mechanics seem clean. In many ways, much cleaner than other young pitchers on the Cards like Michael Wacha, Carlos Martinez and Trevor Rosenthal. Yet something seemed to happen to his shoulder and the cause and effects seems to be a problem. Another young pitcher who had shoulder problems, who could hopefully and optimistically be a comp for Miller, is Stephen Strasburg. Strasburg is a different pitcher than Miller, his mechanics are worse and much more violent. But age-wise and talent-wise, they can be seen as comps. After an explosive start in 2010, Strasburg missed most of 2011. But he came back strong in 2012, posting a 3.16 ERA and an ERA+ of 126. In 2013, he posted a similar 3.00 ERA and a similar 125 ERA+. So the fears for Miller are real and justified. He has gone from a strikeout pitcher to a contact pitcher. He has lost confidence. And more than his results, he has just become a different pitcher.